If you have a liking for mod revival sounds – or just want to do your bit for charity, you might want to get down to Filthy MacNasty’s for a night of live music in aid of the Thyroid Eye Disease Charitable Trust. 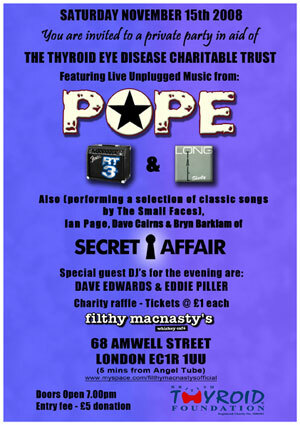 Bands on the bill include Pope, RT3, Long Tall Shorty and Ian Page, Dave Cairns and Bryn Barklam of Secret Affair (playing Small Faces tunes). DJing is courtesy of Eddie Piller and Dave Edwards. It takes place on Saturday 15th November – see the flyer above for full details, with entry a £5 donation.